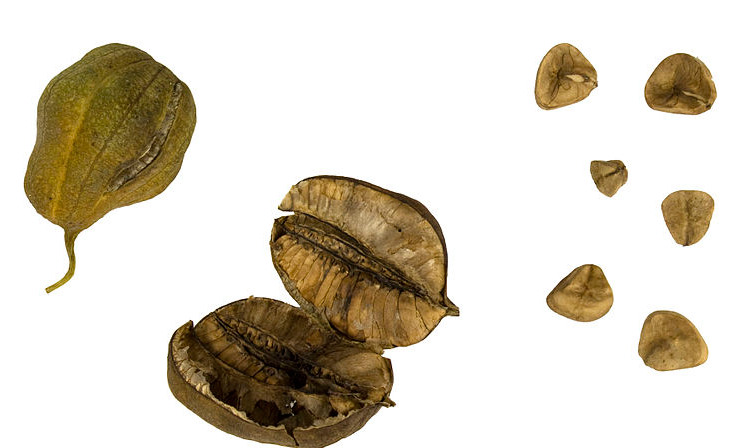 Shapes Pear-shaped fruit size of a nut and opens up in six flaps containing flat, triangular seeds. 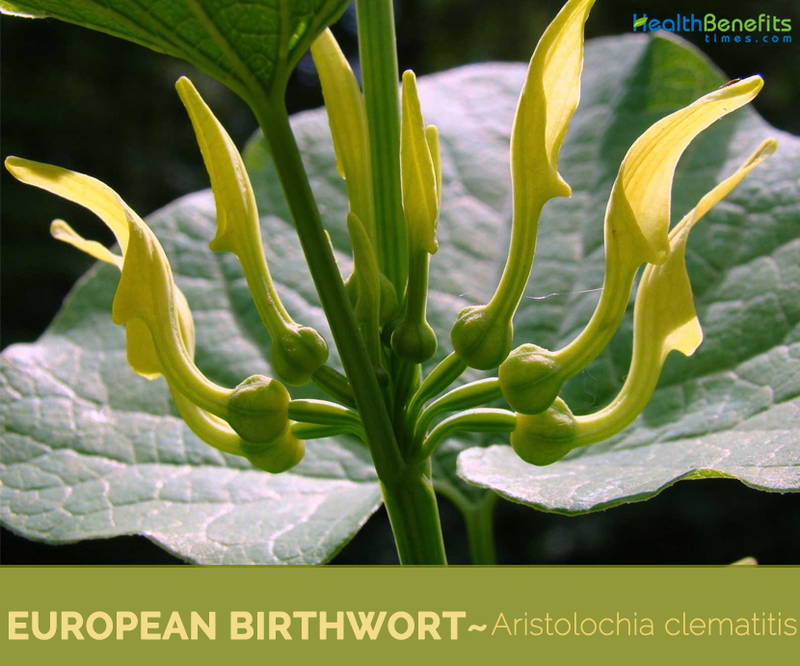 European Birthwort is a twining herbaceous plant scientifically known as Aristolochia clematitis and belongs to Aristolochiaceae family. 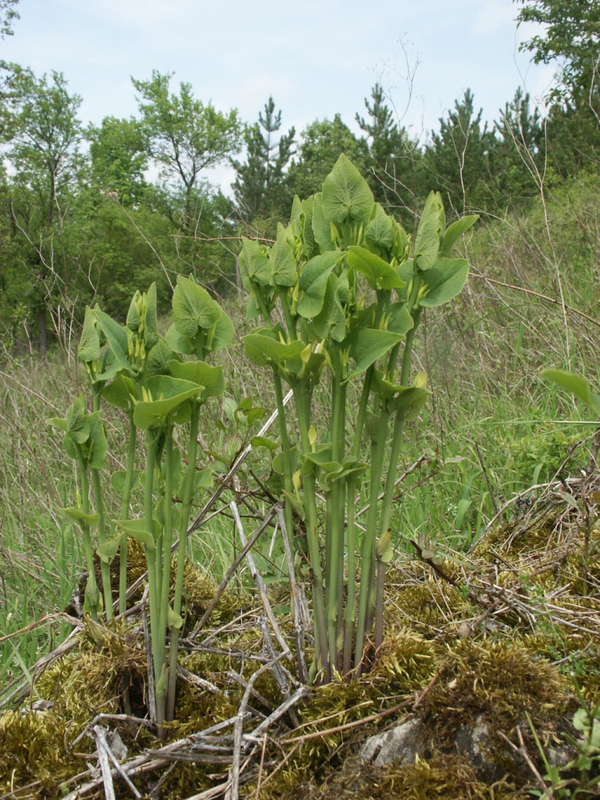 The plant is native to Europe, but has been introduced into and established in a few parts of North America including Quebec, Ontario and New York to Ohio and Maryland where it is most commonly found in the wild along roadsides and in waste places. Some of the most common names given to it are Birthwort, Heartwort, Asarabacca, creeping birthwort, European Birthwort, Virginia Snakeroot, Snakeroot, Dutchman’s pipe and Pipevine. Genus name comes from the Greek words aristos meaning best and locheia meaning childbirth or delivery in reference to the fact that plants of some species within this genus have a flower structure which more closely resembles a human fetus in the womb than a pipe, and served in the past as the source of ancient plant preparations used for treatment of pain and infections incident to childbirth. It was previously used as a medicinal plant, though it is poisonous, and is now occasionally found established outside of its native range as a relic of cultivation. It is now thought to be the cause of thousands of kidney failures in Romania, Bulgaria, Serbia, Bosnia and Herzegovina and Croatia where the plant is thought to be unintentionally consumed through contaminated flour. Urinary tract menaces among those who have consumed the plant are also reported. The link between renal failure and aristolochic acid, which the plant contains, was discovered after a clinic for obesity in Belgium used herbal products based on another plant of the same genus as a diuretic. After a few months, some of the patients experienced kidney failure. European Birthwort is a rhizomatous, deciduous, non-climbing perennial plant that grows about 2-3 feet (infrequently to 4 feet) tall. The plant is found growing in waste ground, roadsides, gardens and orchards and prefers a medium moisture, moderately fertile, well-drained loamy soil, rich in organic matter. Plant has invasive root system. Root is spindle-shaped, ranging from 5 cm to 3 cm in length, about 2 cm thick, fleshy, brittle, greyish on the outside, brownish-yellow inside. A cross-section of the irregular, erect stem is blunt and quadrangular. The stem is erect, simple, grooved and glabrous. 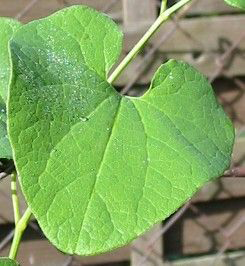 Leaves are alternate, heart shaped pale yellow-green, long-stalked, cordate, yellow-green with prominent ribs. The plant has dirty yellow flowers, usually in axillary groups of 7. Each flower is up to 1 inch in diameter and has a straight funnel-shaped tube with pointed, curved upper lips. The perigone forms a straight tube, which is bulbous beneath and has a linguiform, oblong-ovate, obtuse border. There are 6 stamens, the style is upward growing, and the stigma is 6-lobed. The flower briefly traps the insects that pollinate it. It has foul smelling. Flowering normally takes place from Jul to September. The plant seeks light by ascending the stems of surrounding plants. Flowers are pollinated by certain tiny insects. Each pollinated flower is followed by green, pear-shaped fruit that has the size of a nut and opens up in six flaps containing flat, triangular seeds. Birthwort is one of the old healing plants already in use by the ancient Egyptians and later by Hippocrates, Theophrastus, Dioscorides and Pliny. It was a component in theriac, which was used as a panacea against ulcers, fevers and snakebites. Ancient Egyptian name for the plant translates as ’anti-snake‘. 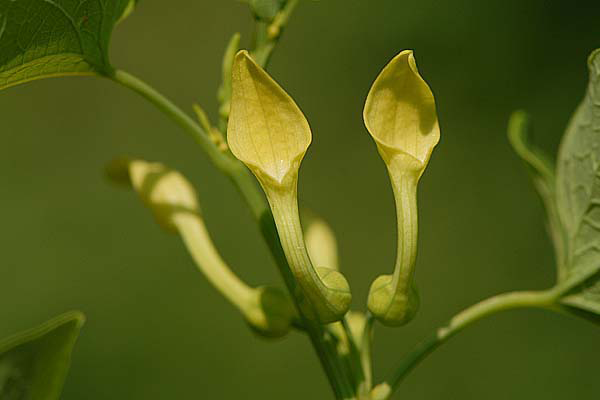 The Latin name aristolochia is made up of áristos and lóchos – ’the best ‘and’ confinement, birth ‘respectively, or ’the best for birth‘. It refers to the use of the plant in aiding childbirth. Hildegard von Bingen taught that Aristolochia opens the closed female inner organs and dissolves hardened menstrual blood. Lonicerus wrote in his 1564 herb book: ’Birthwort powdered and mixed with so much myrrh and used with warm wine purifies the uterus and prevents stillbirth. Every woman in childbirth should drink this herb and root.’ It was also used for chronic ulcers and suppurations. Paracelsus recommended it for cancer, apparently treating ‘like with like’, since in 1981 the phyto therapeutic use of birthwort or aristolochic acid was forbidden due to possible carcinogenic effects. 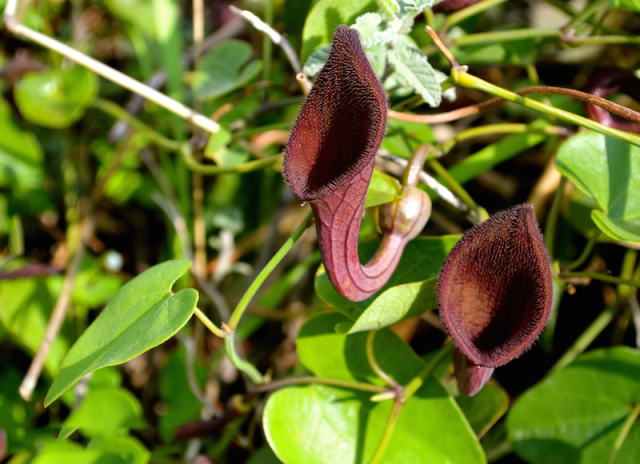 The species name clematitis derives from the Greek ’klema‘for tendril, the growth form of this species of aristolochia. 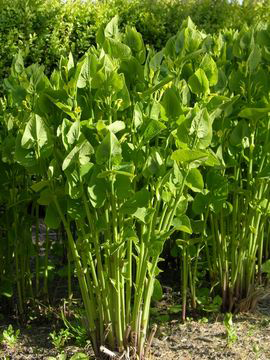 The English name ‘birthwort ‘likewise refers to the plant’s use as an aid in childbirth. It is an aromatic tonic herb that stimulates the uterus, reduces inflammation, controls bacterial infections and promotes healing. Juice from the stems was used to induce childbirth. Plant consists of aristolochic acid which, whilst stimulating white blood cell activity and speeding the healing of wounds, is also carcinogenic and damaging to the kidneys. Flowering herb, with or without the root, is abortifacient, anti-inflammatory, antispasmodic, diaphoretic, emenagogue, febrifuge, oxytocic and stimulant. Externally it is used in the treatment of slow-healing cuts, eczema, infected toe and finger nails etc. 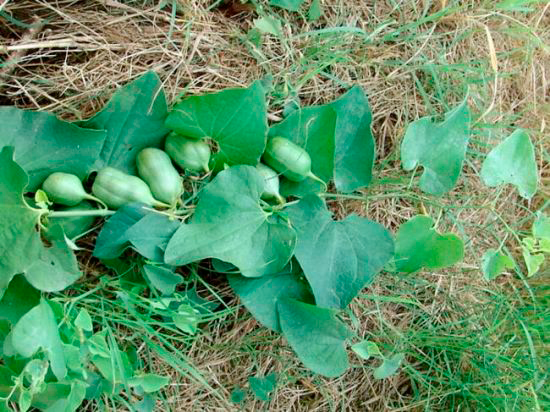 Native Americans used it to treat snake bites, treat stomach aches, toothaches, and fevers. 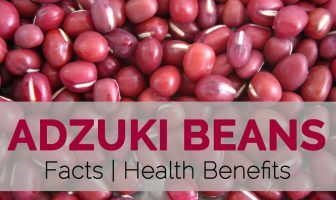 Aztec used it to treat abscesses, dysentery, and deafness. European birthwort was accepted for its ability to treat pain, and edema, and illnesses affecting the lungs in Chinese Medicines. It’s also been used to abscesses, stomachaches, joint pain, and malaria. 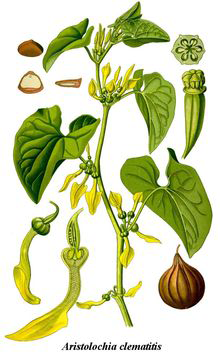 Around the world, birthwort has been used to induce labor, prevent infection, treat wounds, and scorpion stings. It has anti-cancer properties and can be used in conjunction with chemotherapy and radiotherapy. It can also be used in the treatment of acute and serious infections such as TB, hepatitis, liver cirrhosis and infantile pneumonia. It encourages white blood cell activity and is also carcinogenic and damaging to the kidneys. Decoctions were used to heal ulcers as well as asthma and bronchitis. It was used for treating scorpion stings in Sudan. It is used as a contraceptive in India. Recently, it was found to be a contaminant of a weight loss preparation. Pliny says that eating the plant with beef immediately after conception will lead to a male child. 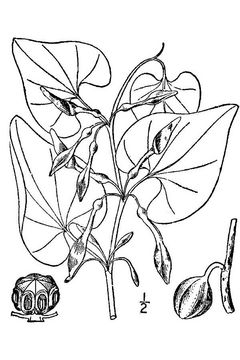 South American variety of Aristolochia is said to have been used in the same way as tobacco in areas where tobacco did not grow. It is often cultivated in gardens as an ornamental. Root and stem are considered poisonous. According to one report aristolochic acid stimulates white blood cell activity and speeds the healing of wounds, but is also carcinogenic and damaging to the kidneys. Use with caution, internal consumption can cause damage to the kidneys and uterine bleeding. It should not be used by pregnant and breast feeding women. It is best to consult with a health care practioner before consuming the herb. Intake of acutely toxic doses leads to vomiting, gastroenteritis, spasms, severe kidney damage and eventually to death by kidney failure. Chronic intake of low dosages among both humans and laboratory animals led to the development of tumors. Fruit Shape & Size Pear-shaped fruit is the size of a nut and opens up in six flaps containing flat, triangular seeds. Available Forms Tincture, cream, poultice or sitting baths.